Born in Zapotlan, Mexico on November 23,1883. 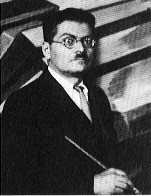 Along with Diego Rivera and David Alfaro Siqueiros, Jose Clemente Orozco started the modernist movement in Mexico. His works are influenced strongly by the culture of the Aztecs. He specialized in monumental works and murals, almost invariably with social themes that were inspired by the Mexican Revolution. One of his most famous murals is the "Epic of American Civilization" (1930) that can be seen at the Baker Library of the Dartmouth College. Died in Mexico City on September 7, 1949.